Drew Doughty is one of the NHL's rising stars. 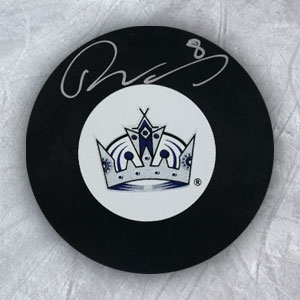 He is a defenseman for the Los Angeles Kings who was drafted with the second overall pick in the 2008 NHL Entry Draft. 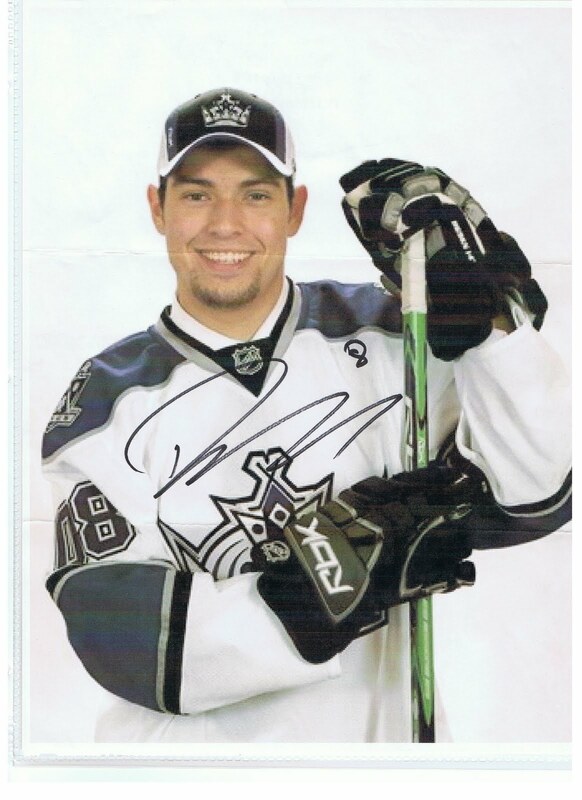 Drew Doughty cards and autographed memorabilia are well respected by collectors, especially by those who collect the Kings. He already has a Stanley Cup Championship and has been a Norris Trophy finalist as one of the league's top defensive players. 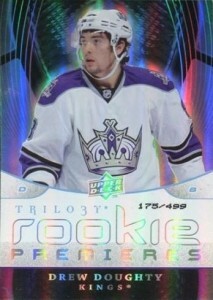 Drew Doughty has 21 rookie cards from various 2008-09 products. Some of them include his first NHL certified autograph and memorabilia cards as well. The values of his rookie cards range from inexpensive base cards to premium, short-printed cards that command top dollar. 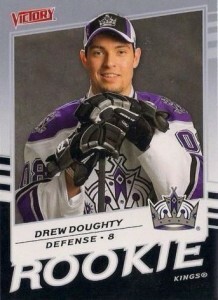 Doughty also has several pre-rookie cards. His first autographed card is from 2006-07 In the Game Heroes and Prospects. The company also produced his first memorabilia card the following year. Both of these cards are minor league cards from his time in the OHL. Being a Stanley Cup Champion has its rewards. An increased demand for autographed memorabilia is one of them. Anything related to the Kings 2012 Stanley Cup victory carries a premium. 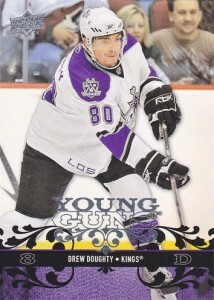 Doughty was a big part of the Kings Championship, which was the team's first in franchise history. This high-end card is limited to just 99 serial numbered copies. On the rare occasion one comes up for sale on the secondary market, they sell for hundreds of dollars. 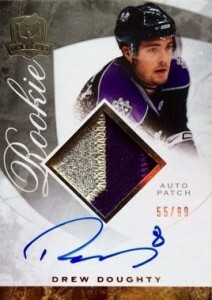 The on-card signature, multi-color patch and low print run make it a must-have for the Doughty player collector. Despite having a much higher print run of 999 copies, SP Authentic Future Watch Autographs carry a lot of prestige with collectors. The large photograph and on-card autograph make it highly desirable. The quantity produced makes it much more affordable than Doughty's Cup rookie card. The Young Guns rookie cards of the flagshipUpper Deck Hockey set have long been held in high regard. Doughty's is no different. It's nice that in this modern collecting era of low print runs, autographs and memorabilia, that the Young Gun rookies from Upper Deck can be pulled from a $3-4 pack of cards and still be valuable. Below you will find examples of what an authentic Drew Doughty autograph looks like. This can be used as a first point of reference for determining the legitimacy of autograph memorabilia, but is not a substitute for having your items authenticated by a well-respected professional autograph authentication company. Some of the trusted sources within the sports memorabilia market include the following companies: PSA, JSA, and Mounted Memories. Click on any of the images below to view full size photos. It is very quickly written and consists primarily of his first initial "D."
The "D" is formed with a down stroke of the pen that then curls back up and around. Coming off the "D" is a small curved line that flows into a check mark looking shape. A character that looks like an "S" resting on its side is next. His jersey number "8" is often inscribed.